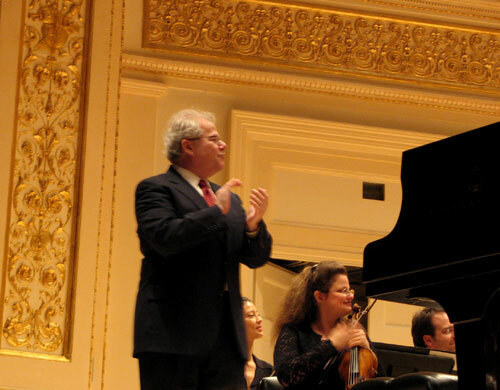 Pianist Emanuel Ax was performing an all Mozart program with the Orpheus Chamber Orchestra at Carnegie Hall tonight, celebrating the 250th anniversary of the birth of Wolfgang Amadeus Mozart (1756–1791) and the 30th anniversary of Ax’s first collaboration with the conductorless ensemble. Ax first came to the public’s attention in 1974 when, at 25, he won the first Arthur Rubinstein International Piano Competition in Tel Aviv. Since that auspicious start, Ax has gone on to win numerous awards, including the Avery Fisher Career Grant (awarded annually since 1982 to outstanding solo instrumentalists) and several Grammys: two for his solo recordings and five for collaborations with Yo-Yo Ma, Jaime Laredo, and Isaac Stern. 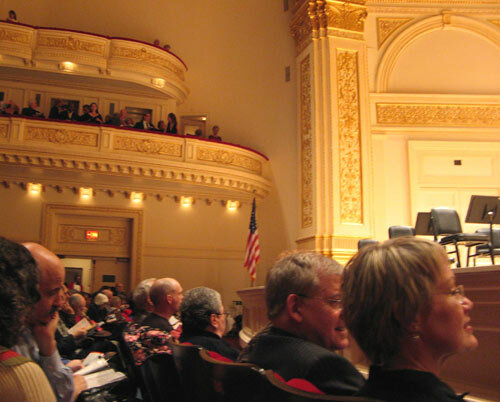 That afternoon, I placed a call to the Carnegie Hall Box Office and was surprised to learn that there were still seats available to that night’s performance. Better still, they were offering last minute $10 (cash only) tickets. 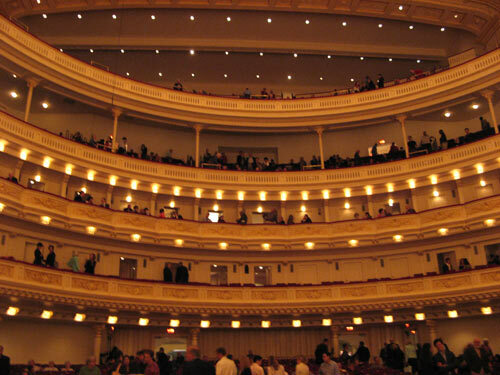 At that price, it didn’t even matter where in the Hall the seats were: we were going to Carnegie Hall! SYB left the office early to pick up the tickets. After he and I met up for a quick pre-concert bite — one booth over from Atoosa Rubenstein — it was off for an evening of Mozart. I don’t know why, I don’t know how… but here we are again: second row center! 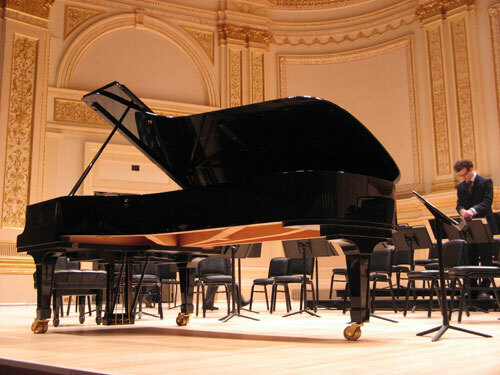 From our seats, we were close enough to see the flying hammers reflected in the propped, glossy lid of the grand Steinway. Ax’s playing was “fluid, elegant and refined,” as the New York Times noted in their glowing review of the concert. I was intrigued by how the leaderless Orpheus managed to keep their playing even and well-tempered, especially during some of the pieces’ more fluid, running segments. A different core group shapes each piece, shifting seating assignments and providing cues for their respective sections. 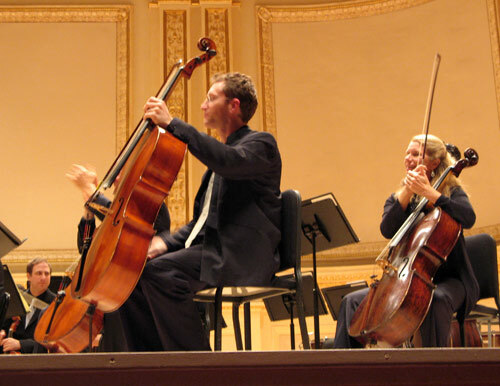 The process requires almost twice as many rehearsals, but allows the individual ensemble players opportunities for input not possible in a conductored grouping. Other manuscripts from the Vienna years include those of the somber Fugue for Two Pianos in C Minor, K. 426, Mozart’s only keyboard fugue of any distinction; two of his best-known piano concertos — in C, K. 467, and D (“Coronation”), K. 537; Der Schauspieldirektor (The Impresario), the only manuscript of a Mozart opera in this country; the Piano Rondo in D, K. 485, known to piano students around the world; the Horn Concerto in E-flat, K. 495, written in four different colors of ink; and the arrangement for voice, violin, and piano of Cherubino’s aria “Non so più cosa son” from Le nozze di Figaro (The Marriage of Figaro), the only complete arrangement of an operatic number Mozart is known to have made. The exhibition ends with the exceedingly rare first edition of the Requiem, K. 626, left incomplete at Mozart’s death. I’m constantly amazed by the sheer depth of Mr. Morgan’s collection. Definitely checking this out.